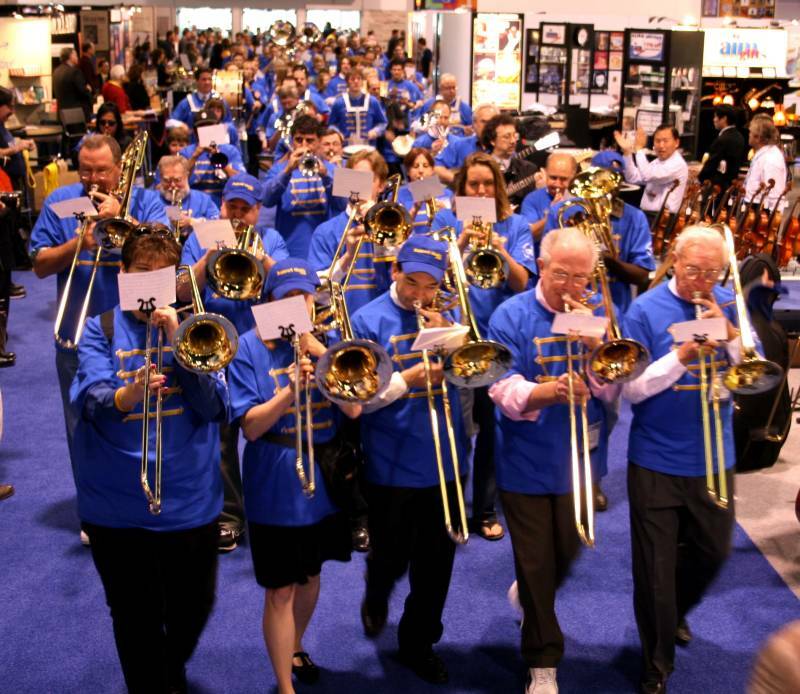 NAMM (acronym for "National Association of Music Merchants") presents an annual International Trade Show, usually around the middle of January, at the Anaheim Convention Center in Anaheim, CA. 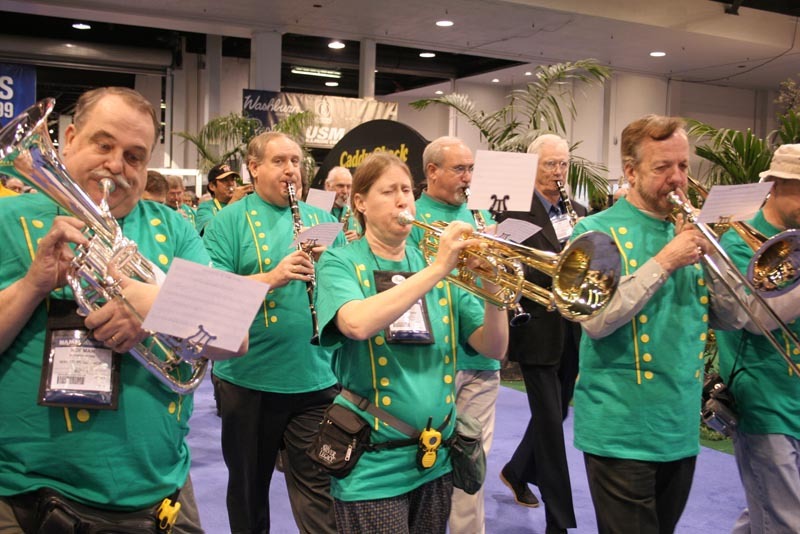 On the opening day, any badge holder may participate in the marching band, directed by (now) retired NAMM CEO Larry "Link" Linkin, which kicks off the show. Players sign in, get shirts (and sometimes hats), pick instruments from the show floor, gather to rehearse the song for the day, and then march at opening time (10:00 am) playing the song several times and stopping two or three times along the way to play the "Star Spangled Banner." We have participated in the band almost every year since 1997 and we present four photos here. The photos were taken by NAMM photographer Stuart Robertson and appeared on NAMM's website. Thanks to NAMM's webmaster Jay Euell for sending us the jpg files and to NAMM for allowing us to reproduce them here. 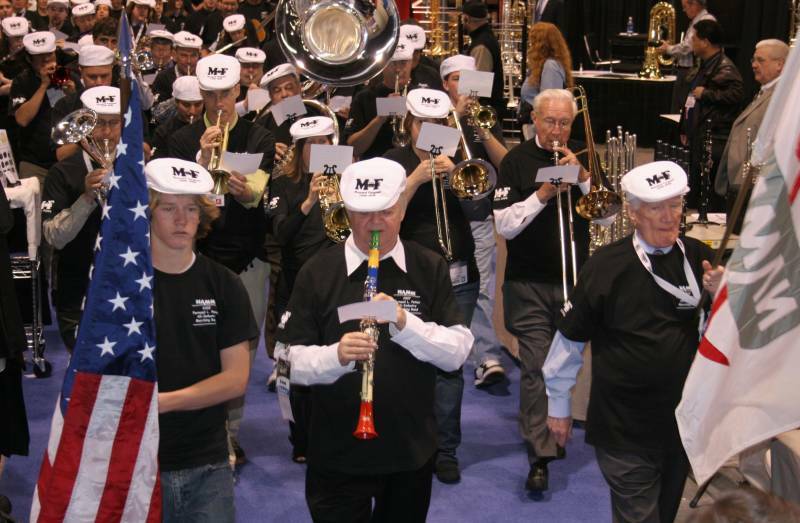 This photo from the 2008 show has Norm with his white Maynard Ferguson hat from last year (see the picture below) playing a Getzen inline double-valve bass trombone with Yvonne beside him playing a Getzen tenor trombone with F attachment. Paul is back there playing cymbals, but all that can be seen of him is his black hat above the head of the person to the left of the bass drummer. This photo from the 2007 show has Yvonne behind "Link" Linkin (with the colorful clarinet) playing a Getzen bass trumpet between an Eb alto horn player and a trombone player. Norm marches behind her playing a Jupiter 4-valve sousaphone. Paul is back there somewhere playing cymbals, but didn't make it into the picture. Jen tagged along as well, but didn't play anything. She did, however, lead the singing of the National Anthem when the band stopped for that. This year we not only got the band shirts, we also got hats in memory of the late Maynard Ferguson. In this photo from the 2006 show, Norm is front left playing a Kanstul Eb alto/tenor horn and Yvonne is next to him playing a Getzen bass trumpet. Daughter Jen was playing the bass drum, but didn't make the NAMM photo. 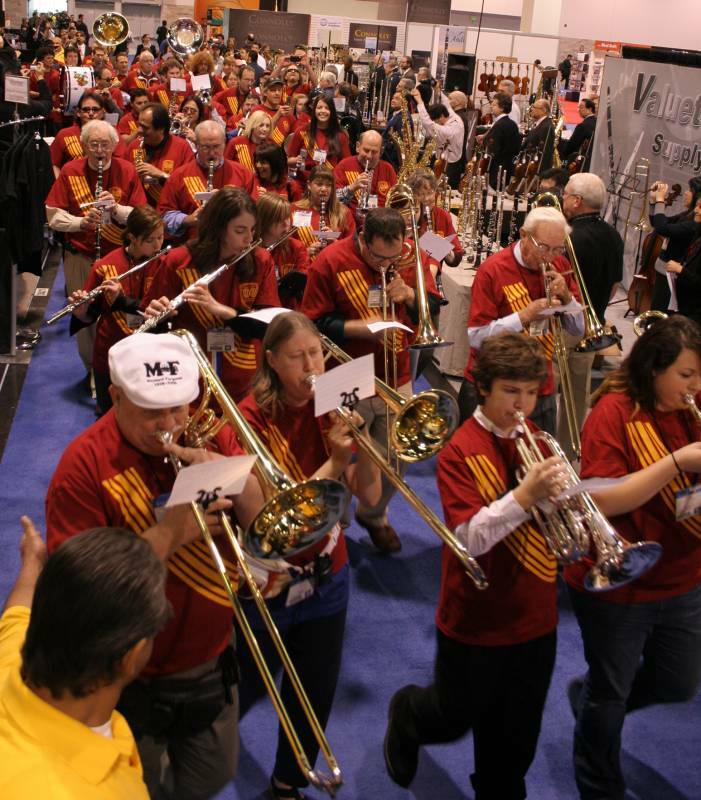 This photo from 2005 shows Yvonne in the front row, second from the left (wearing shorts and hiding behind the music), playing a Jupiter bass trombone. Norm is behind her playing a Jupiter marching baritone (between two trombone players).